Most college students look for a mentor, someone a little older with experience in their field. I’ve been lucky enough to have many wonderful mentors throughout my life, especially during my college years, but there is one who has really been there for it all…and she’s more than 2,000 years old. When I was little, I always spent a week at camp…Museum Discovery Camp, that is. 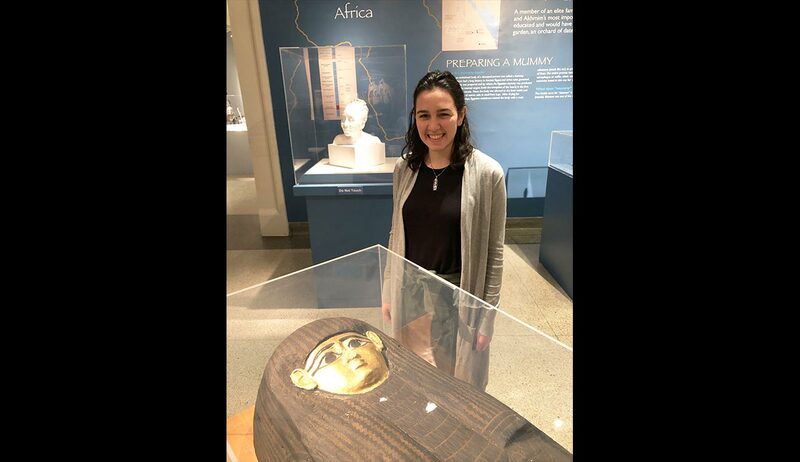 One day during gallery time, I was looking at Nefrina when the camp leader approached me, explained how to read the temperature gauge inside the mummy’s case, and outli­ned the damage that could result from an improper temperature. He made me promise to always check on her when I was at The Museum—and I still do to this day. Fast forward ten or so years: I major in Communications Studies with a double minor in Museum Studies and Anthropology at Susquehanna University. As a soon-to-graduate senior, I wanted one more museum experience. I contacted Emily Moore, The Museum’s Manager of Marketing and Digital Media, whom I interviewed for a project my sophomore year—right around the time that I finally realized I want to work in museum communications. We reconnected and made arrangements for me to intern at The Museum over my winter break. I’ve spent the past few weeks generating content for social media, assisting with events (my big claim to fame: being a Bingo caller and confetti-releaser at Noon Year’s Eve), and designing promotional brochures. I even had the opportunity to create an infographic for Feed Their Imagination, a program that provides financial assistance for field trips to The Museum! Interning at the Reading Public Museum brought me back to my roots, to the place where I first learned to love museums. Since I was a camper here, I’ve watched Nefrina’s journey from CAT scans to an updated gallery space and facial reconstruction. During the summer of 2017, I spent ten days visiting the ancient sites in Egypt that I had longed to see since my camp days. That same summer (and the following), I interned in the Marketing and Communications department at the Penn Museum under an alumnus of my university. Recently, as I excavated my personal experience as a Museum Studies minor, I made a discovery. The Reading Public Museum purchased Nefrina’s mummy and sarcophagus from the Penn Museum (then the University Museum) in 1949. The funerary mask continues to reside at the Penn Museum, but spent a year reunited with Nefrina at the RPM in 2012. In the end, it turns out I wasn’t just following her modern journey…I was tracing her past too. Thanks for everything, Nefrina. I wouldn’t be here without you.